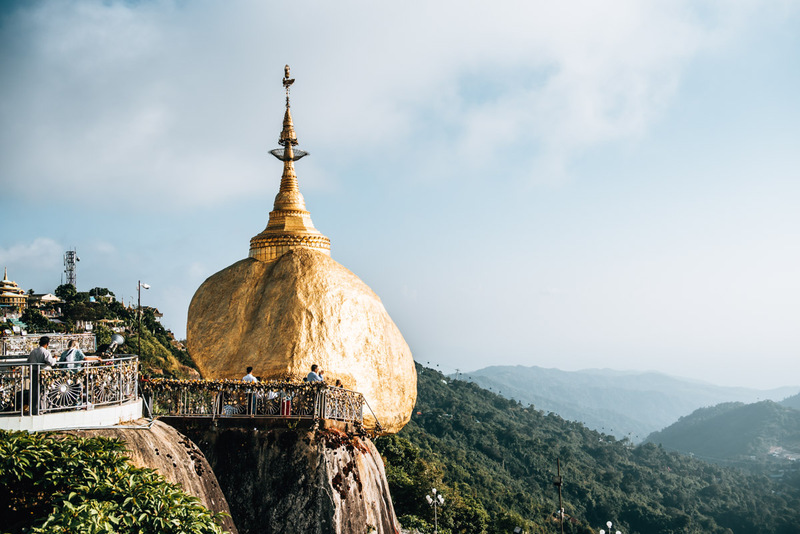 Here, located about 160km north of Yangon, you can discover one of the most sacred site in all of Myanmar: the Golden Rock – also called the Goldener Fels (German) or Kyaiktiyo Pagode. Like a throne, perched on amountain summit at 1100m elevation, it is a sight to behold. 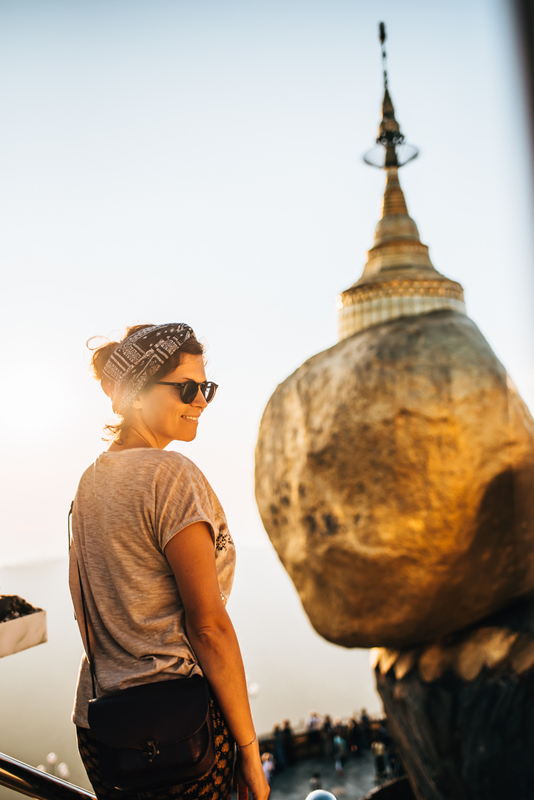 This was one of the most spectacular destination on our Myanmar trip and we want to share with you some of our tips for this place! Gravity doesn’t seem to affect the Golden Rock. Only when you are standing in front of the Holy Rock, do you begin to wonder about it’s presence and significance. 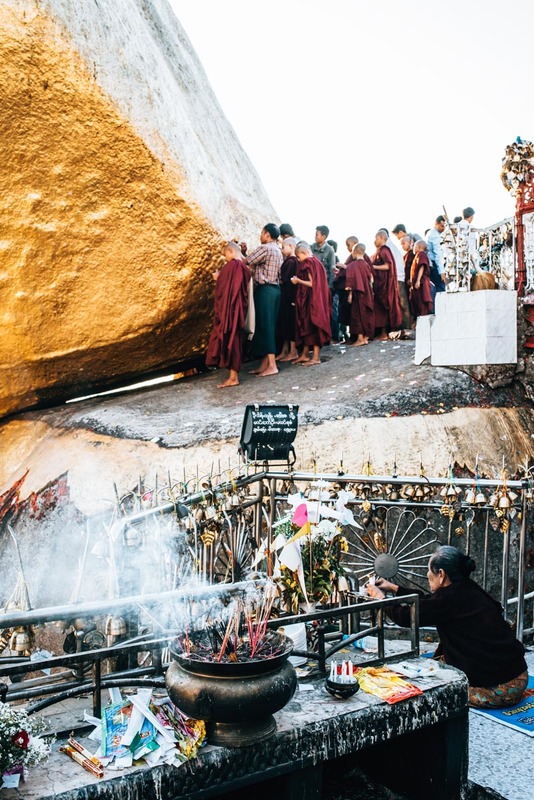 According to Legend, the Golden Rock is held in balance by the two hairs of Buddha. What fascinated us the most about the Golden Rock? On one hand, it was the magically spiritual atmosphere. We had expected to find many local pilgrims, however, it’s significance for the Buddhists only became apparent to us as we stood before the spectacle ourselves. On the other hand, the breath taking mountain landscape encircling this golden gem, left us speechless at it’s wonder. 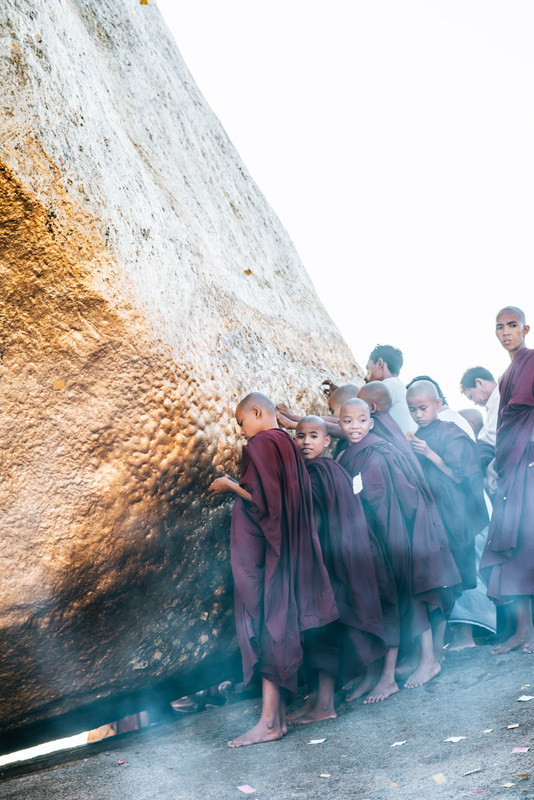 The Golden rock itself, like all important Buddhist sites in Myanmar, are, unfortunately, only allow to be touched by men. Women are only allowed as far as the gate, from there they can only watch, as theprivileged gender exclusively add one golden leaf after another, to the mighty Golden Rock. Naturally, it was very frustrating but we had toaccept it. We found our consolation when the sunset bathed the Golden Rock in it’s glory and presented us with a view far more beautiful at adistance. Currently, as of December 2017, foreign tourist must pay an entrance fee of 10,000 Kyat. Be warned, that you also have to take your shoes off and walk a good stretch barefoot. The fact that your feet will get dirty from the ground is inevitable when travelling in Myanmar. After some time, you get use to it so don’t worry. We would recommend to allocate at least two hours to reach the site. 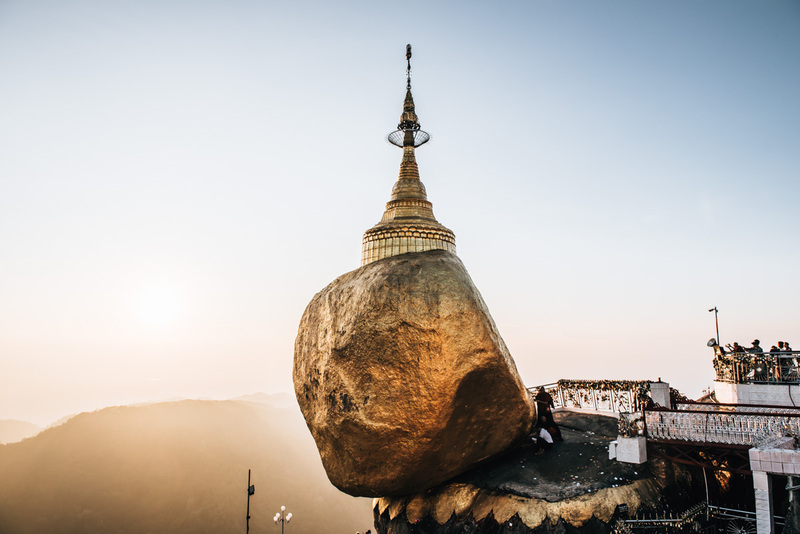 If you want to visit the Golden Rock, you’ll first have to make your way to the small town Kinpun, located at the foot of the mountain. Most of the travellers either come directly from Yangon or, like us, from a place called Bago, which is on the way. From Yagon, there are direct bus connections running daily and very frequently. It takes about 5 hours and costs 8,000 Kyat for the ride. Since we came from Bago, which is roughly half way in, the bus ride only took around 2.5 hours and cost us 7,000 Kyat. The reason behind the almost identical price for half the journey is that the places are kept free for the entire journey, so you always have to pay for the entireroute. At least, this is what we were often told and it sounds plausible. Alternatively, you can also go by train from Yangon and Bago to Kyaikto.The ride itself is quite spectacular and not to mention cheap too! 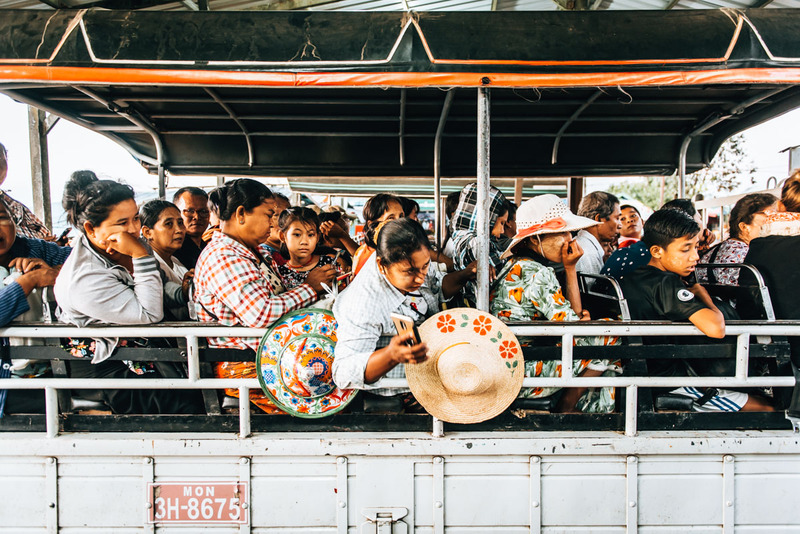 The journey is about the same as the bus, roughly 5 hours, however, the last stretch to Kinpun can only by reached by bus or private transport, which takes approximately an extra 25 mins. So once you reach the starting point in Kinpun, you are separated ‘only’ by the stretch to the summit with the anticipation of seeing the Golden Rock. “Only” is an understatement, for this is no doubt the most exciting part of the entire journey. It’s like this, the mountain trail leading up to the Golden Rock is relatively windy and in many parts, very steep and narrow. In order to allow masses of people up the mountain, the locals came up with an interesting idea. They reconstructed old trucks which now drive up and down the mountain in an exclusive manner. However, they are reconstructed in a way that the cargo area is equipped with (very narrow) wooden benches, and this serves as the seating area. The whole setup is just as uncomfortable as it sounds. Honestly, it was borderline torture, mainly because every time you hit a curve, you’d slide along to your left and then your right, like playing corners – but unwillingly so. This entire ‘Sardine Ride’ lasted about 45 mins, technically it was two 15mins on the road with a 15 min break in between to let other trucks and traffic pass through. Speaking of opposing traffic, that was probably the only good thing on the whole ride up and allowed us to breathe a sigh of relief. Luckily, the road is only open to one flow of traffic at any one time – something you will be especially grateful for if you end up with crazy chaotic drivers. A one way ride up to the top costs around 2,000 Kyat (as of December 2017). Those who wish to ride in cabins/couchettes pay 5,000 Kyat. It goes without saying that these spots are very highly sought after and thus are often taken or booked well in advance. Once you hop off the trucks at the final stop, there is still a good 20mins hike by foot before you reach the end and finally stand face to face with the Golden Rock itself. The trucks journey daily from 6am until 6pm. That means, the last vehicle to leave for the Valley is around 6pm. So for those that want to go the refor sunset, you’ll have to read till the end of the article to find out! Ah and another tip: if you’re taking one of the last (or earliest) rides up, most likely it’ll be rather dark and cold at the top of the mountain, so we’d recommend bringing some extra layers to put on. At the top of the mountain, just a few minutes walk away from the Golden Rock, you can find a handful of accommodation offers. The vantage point of these places is obviously the stunning location. You can go up to see the Golden Rock whenever you want, sunset or sunrise without having to deal with the hassle of transport. The main con of this amazing location is of course the price, as one would expect due to the high demands. The price for one night far exceeds the average prices in Myanmar and you can expect to pay about 100 euros per night for a double room, but don’t expect any luxury here. In addition, these hotels are usually well booked out during the peak seasons, so best to plan far ahead if you want to stay here. On the other hand, the local Pilgrims have found a much more cost effective alternative. They simply spend the night atop the mountain with only their sleeping bags. We never expected to see so many people, gathering in hundreds, sleeping modestly under the vastevening skies next to the Golden Rock. This option is of course, questionable, as it does gets rather cold up here at night so make sure to pack enough warm clothes if you decide to freedom camp. At the bottom of the mountain on which the Golden Rock is perched upon, there is a small village called Kinpun. Over time, it has established itself as the main pit stop or base camp for those adventuring up the mountain. So here, you’ll find relatively well developed infrastructure with hotels, restaurants and small shops. It goes without saying that the downside of the hotels in Kinpun is its location. In order to visit the Golden Rock, you have to get over the mountain and that’s really only feasible with the local trucks, which unfortunately only drive between 6am and 6pm. Meaning that with luck and timing, you can enjoy a glimpse of the magical atmosphere ofthe sunset in certain months. We ourselves actually ended up staying at the Golden Sunrise Hotel. We found the area to be very nice, but unfortunately we couldn’t say the same for our room. It was on the ground floor, shaded and dark, but what bothered us most was the intoxicating smell of mould. We reckon the rooms above are much better so heads up: always better to have a look around first and get a picture of what the place looks like. Sunset at Golden Rock – is there a best spot to sleep? This is a tough question because the time of the sunset varies according to the season, so ‘best’ sunset spots change in respect. During our visit in December 2017, the sun had already disappeared around 5:30pm. So we had plenty of time to capture the beautiful sunset mood before taking the last bus back to the valley at 6pm. (Tip: make sure you factor in the extra 20min walk to the bus). So in the end, we decided to stay the night in Kinpun, but not only du eto cost reasons. We certainly don’t regret our decision not to sleep up the mountain by the Golden Rock, however, we were a little gutted that we couldn’t stay and enjoy the sunset till the very end. On the bright side, we left satisfied, knowing that we’d experienced the most beautiful moments, especially with the atmosphere and lighting creating these soft moods and unforgettable scenery. If you happen to visit the Golden Rock in the summer months, you will notice that the sun sets a little later here (about 6:30pm in June), making the overnight stay option on the mountain much more attractive. 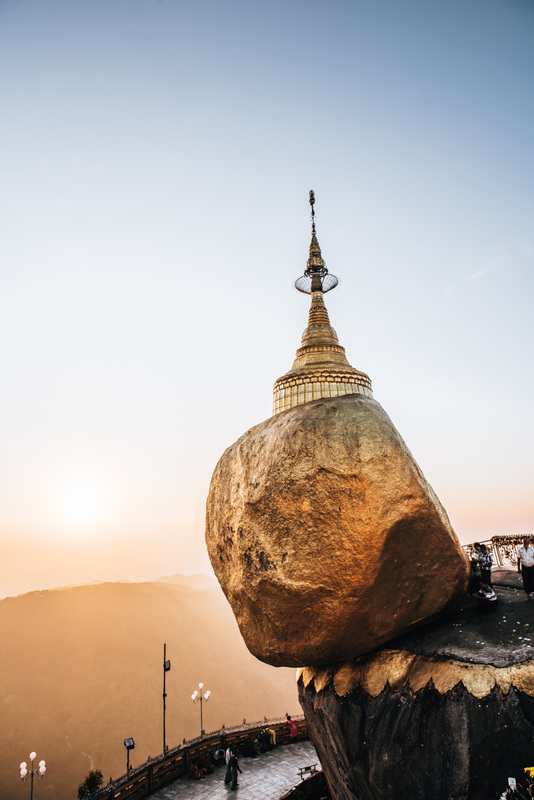 In our opinion, the Golden Rock at sunset is simply mesmerising, the way the light hits the rock at this time of day is extraordinary and gives off such an impressive flair, we would not have wanted to miss this for anything!